Interview on Special Train called the ‘Aga Khan Express’ in West Pakistan | Ismaili.NET - Heritage F.I.E.L.D. His Royal Highness would give priority to fostering relations between different Muslim countries in the economic field rather than in social, cultural and other spheres. He said it was essential for Muslims all over the world to build up their economic position and raise the standard of living of their people. If they could pool their resources, their task would become much easy. Similar was his advice for Asians. He said that while other countries had advanced too far in this atomic age, Asians must make every effort to be aware of and adopt the newest scientific discoveries in their own countries. The best course for them, he said, was to go all out for improvements in all directions, so that they may come closer to Western countries in economic, scientific, educational and other spheres. 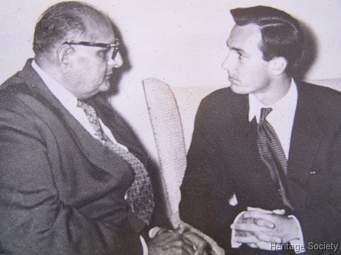 Asked whether he was also of the view that Arabic should be the national language of Pakistan as the late Aga Khan had suggested once, the young Prince Karim said that every Muslim must know Arabic, but also every country must preserve its national heritage and as such it was not advisable to adopt, without preparation, any new language, as a national language. He said that the least that he would find acceptable was to keep Arabic as an optional language, with the possibility of making it national language at a later date. Prince Karim said that he had no intention of entering into politics for the present. He had too much work, he explained. The Aga Khan who had acquired all horses of his father Prince Aly Khan said that he had decided to race the horses to keep up his family traditions.